We appreciate you early adopters who have worked with Eva from the beginning and have willingly provided your feedback and suggestions. Thank you! Eva is a blend of science, technology and standard training principles. Our human voice is a complex instrument, and to effectively define the elements that combine to create our own unique voices, we’ve used accepted voice science and speech therapy practices. The Exceptional Voice method breaks the components of the voice into nine training elements, each of which is taught in specific lessons. Eva’s innovative methodology consists of video-based instruction, self-guided exercises for each lesson that use specifically designed tools to visualize the voice output, and a series of stand-alone tools that provide the user with a straightforward and playful learning experience. Eva 2.3 provides additional tools and lessons in one easy-to-navigate app. Additional lessons can be downloaded from within the app as users progress with their training, and multiple stand-alone tools–such as a pitch tuner–are available for exercising outside of the structured lessons. 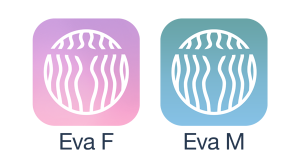 Eva 1.0 for trans feminine voices was first released in March 2013 for iOS and Android platforms. Almost immediately we received a trove of emails from trans masculine people asking about an app for them. Eva FtM was released for both iOS and Android in August 2013. Quite early on we realized that our complex pitch analysis algorithms were too difficult to code using a cross-platform strategy. So we discontinued developing for Android devices because iOS is a perfect closed system that uses the same microphone specifications for each of its devices. We are developing for iOS only at this time. We will build out the Android platform at a later date. Our funding is limited and we do not have the resources at this time to devote to solving the pitch analysis issues with which we are faced. Eva is compatible with iOS mobile devices (iPhone, iPad and iPod Touch), which run iOS 7.0 and higher. Eva will not run on older devices, such as the iPhone 4 or 4s. We do not have plans to develop for MicroSoft mobile devices. Eva MtF is a free download, which includes a free sample lesson so that you can get an idea of how Eva works. When complete, Eva MtF will have three courses (with multiple individual lessons) tailored to the developmental level of one’s voice. Each Eva lesson is $4.99. The Pitch Tuner for Eva MtF 2.3 is activated when you download the app. The metronome and sound pressure level meter (found on the Tools page) open when you purchase the lesson associated with that tool. For example, the SPL meter becomes activated when your purchase one of the two loudness lessons ( Lesson 13 and Lesson 14). Eva FtM, our trans masculine app now has five lessons. When complete, Eva FtM will consist of a single course of ten lessons. Q: Why am I having problems downloading the lessons, and what do I do? A: The wonky download issues are mostly due to the fact that the videos, which are an incremental part of the training program, are large files. You’ll need an excellent internet connection when downloading the lessons. Q: I had trouble finding Eva in iTunes. Where is it? Q: I purchased Eva on my iPhone. Now. I can’t find it on my iPad. How do I use Eva on my iPad? A: Eva was developed of the iPhone, but it will run on an iPad. To download your purchased lessons to your iPad, click the “App Store” icon from your home screen, click “Purchased,” then in the upper right of that page you’ll likely see “iPad Apps,” click that and in the dropdown menu will see “iPhone Apps,” click it. The apps you have on your iPhone will appear. Find Eva in the list and click to download it to your iPad. Q: Why won’t Eva run on my Android? A: We’ve had complaints about why Eva is not available on more Android devices. We are working to perfect the functionality and user experience for only iOS devices (for now). The are at least 1600 different Android devices, most of which have different microphone specifications. These differences have created fatal errors in the pitch analysis algorithms and since we have a limited budget, we simply do not have the resources to make the appropriate adjustments to the code to offer Eva for Android devices. We hope to get back to this part of the project in 2018. Q: I can’t listen to the videos with my headset. A: When iOS was updated in the spring 2016, the earbuds, headphones and blue tooth functionality had some problems. Also at that time, we experienced a slow-down with our development team, which is partly why we’ve added our own developer–a gifted, talented and committed software engineer. We anticipate this issue to be corrected very shortly. We are hard at work developing the Resonance Analyzer using our proprietary algorithms, designs and coding. This tool will help you make the micro-motor movements in your mouth and throat that will re-shape your vocal tract so the resonant tone of your voice has the feminine quality you want. We are still quite early in the process of delivering all the lessons and courses that will ultimately help transgender people find their voices (both MtF and FtM). The beginner’s course, Eva MtF Voice Feminization Fundamentals is nearly complete. Thirteen of the twenty lesson are available now. We here at Team Eva are asking you, our users, for help. In order for this innovative technology to mature into its greatest version, we need your help. Please share this information about Eva with a friend, your physician, your therapist and others in your support group. IMPORTANT: Do not re-purchase the apps you may already have for Eva 1.0. These early apps were not updated. Those apps will NOT migrate to Eva 2.3. You can continue to work with those lessons on your device and switch to Eva 2.2 to work with the new lessons and tools.